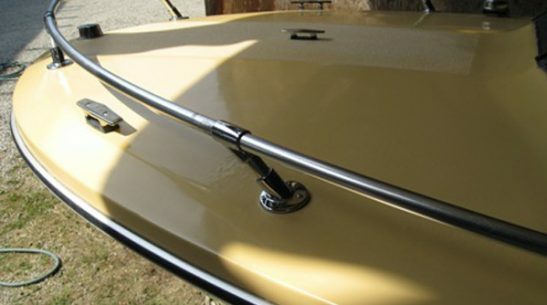 How much does boat detailing cost? Prices are by boat length, type of boat, what areas you wish to be cleaned and whether the boat is afloat or ashore. We provide free quotations which include our time and products. We do not charge by the hour or for extra products. We have a guarantee of service. Who are you accredited with? We are members of Boating BC and internationally we comply with the British Marine Federation Environmental Code of Conduct in association with the Royal Yachting Association and their initiative the Green Blue. How long does the cleaning and protection last? Experience to date is that the cleaned gelcoat finished with its protective coat should remain clean and shiny for at least a season, particularly if regularly washed down with the recommended wash product. For areas with little airborne or waterborne pollution, it is anticipated the service will achieve even better results. Conventional waxing usually lasts 4-6 months for the hull and 3 to 4 months for the deck. How do the products work? The products gently deep clean, removing dirt and stains effectively. The products enhance appearance and protect the boat and do not contain PTFE or silicone. The products do not produce any incompatibility with later repairs or painting. I have yellow stains on the hull and “chalking” on the deck. Can you help? In the past a cutting compound and a buffer were used to remove staining and chalking (oxidation) by grinding it off the surface. Cut back the surface regularly and soon you end up with no gelcoat. Our products are non-abrasive and do the job without harming the gelcoat. Can you clean painted boats? Yes, normally we can. We test on a small area before starting. Can you restore colour on a hull? Yes we can. Can you clean stainless stanchions and fittings? Yes we can. I think I need to re-paint my boat. Professional painters are so expensive. Any ideas? Often a boat doesn’t need completely re-painting it just needs to be cleaned, some restoration work completed and then protection applied. How do I keep otters off my boat and can you clean up their mess? We recommend using moth balls in trays in the cockpit and ensuring all access points are sealed. We’ve heard sprinkling a domestic cleaner like Ajax on the dock beside your boat, the swim platform and the cockpit will also keep them away. We can clean up the mess and deodorize the boat, but you will probably need to replace any soft furnishings, such as cushions. How do I clean the bottom of a boat? When you have your boat hauled out of the water onto the shore, the marina or boatyard staff will use a high pressure wash machine. The machine blasts off the dirt, weed and barnacles from the hull, props, shafts and rudders and the run off from any bottom (anti-foul) paint washed off with the dirt is collected and filtered to remove harmful paint particles before the water is returned to the sea, river or lake. You may also need to scrape off some areas with a hand scraper where the high pressure wash lance cannot reach. For further information talk to your marina or boatyard manager.